Saints fans finally got the news that they had been waiting for the other day when it was announced that the Black and Gold had signed the #1 rated tight end this year in NFL Free Agency, Oakland Raiders Pro Bowl tight end Jared Cook. Cook, who turns 32 next month, is a 10-year NFL veteran with a decade of experience under his belt; but yet he's still in top physical shape and appears to still have a few good seasons left remaining at playing at a high level which saw him set career highs last season in catches, yards, and TD's. 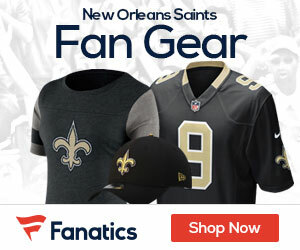 But Who Dats are even more excited about the thought of how the Birmingham, Alabama native will now give the team some additional "fire power" for their high-scoring offensive attack that already features All-Pro WR Michael Thomas and soon-to-be 3rd year NFL superstar RB Alvin Kamara. With the lone exception of one NFL season back in 2015 (with Aaron Rodgers in Green Bay), Cook has never had the opportunity to play in an offense with an elite-caliber QB throwing him the football — and now gets to play alongside Drew Brees as the team prepares to make one last run at winning the Super Bowl. That's why this morning you can't help be giddy as Saints a fan to think of the mere notion of how Cook should potentially thrive in the offense employed by head coach Sean Payton, that will allow the 6-foot-5, 255 pounder to utilize his speed and athleticism in an offense tailor-made for his outstanding receiving skills. Playing with Brees in Payton's scheme should provide Cook with a golden opportunity to shine and possibly put up numbers that could actually exceed his production last season with Raiders QB Derek Carr, when he caught 68 passes on 101 total targets for 896 yards and 6 TDs. Many considered Cook THE top option in the Raiders passing attack for Carr in each of the past two seasons, as the still-dangerous Cook led Oakland in receiving yardage throughout that very same period. In 10 NFL seasons, the 6-foot-5, 252-pound Cook has played in 149 games (with 77 starts) and has caught 425 receptions (on 711 total targets) for 5.464 yards and 25 TDs. As mentioned previously: even in his early 30's now, Cook still remains as one of the more athletic tight ends in the League. Cook still possesses an adequate amount of speed which allows him to beat linebackers, and his NBA "power forward"-like size makes him too big to defend one-on-one against most safeties. No, he probably isn't nearly as good as Travis Kelce or Zach Ertz, but he definitely is a reliable weapon for any NFL QB in the passing game and seems to actually have gotten better with age. And he seemingly would be the one missing piece that New Orleans currently still has in their offense. It's important to note that an athletically-gifted tight end like Cook presents the biggest challenge to a rather wide majority of NFL defensive coordinators, when it comes to designing coverages. Seriously — how you do you defend a player who practically has an offensive lineman's body but can run as fast as a wide receiver? Do you put a middle / inside linebacker on him in pass coverage that can match up physically with him but who might not have the speed to pull it off? Or do you go with an alternative such as putting a DB from the secondary that has the quickness to keep up with him but who is still overwhelmed by Cook's notable size from a physical standpoint? One has to imagine that in a manner akin to that of a "mad scientist", Payton will devise and come up with a variety of methods that will require defensive opponents to remain awake at night figuring out how to stop it or prevent it from happening somehow. Cook at his age even now still can run a (4.49) 40-yard dash time, and is the perfect blend of size and speed to be a focal point of any type of offensive game plan. With teams focused on stopping Thomas and Kamara, it potentially will leave Cook with an advantage to utilize his distinctive capabilities to completely eviscerate opposing linebackers in open space. Typically, most NFL linebackers in pass coverage drop back and cover underneath zones, though the middle linebacker may take a deep zone, But with the Saints having an established receiving threat at the RB position with Kamara, it is only natural for the linebackers to pay more attention to him. In turn, that likely will leave open zones behind them for Cook to work against. Nevertheless, Cook's biggest impact for the Black and Gold is that his addition now gives New Orleans one more weapon within their high-powered arsenal to maintain their aggressive approach; and even though his best years as a run-blocker are likely behind him, he still is more than capable of being a dependable contributor in that facet of the offense as well. Payton and the Saints like to incorporate a ton of play action as well as a variety of RPO (“run-pass option”) plays within their scheme, and their usage of multiple personnel packages should now provide them with the flexibility to attack a wide variety of defensive personnel packages with Cook as the focal point . Remember: this is a player that even at his age had four games last season with more than 100 yards receiving. That includes last year's 2018 Season Opener when Cook set the Oakland franchise record for a tight end with 180 receiving yards (on 9 catches) against the Los Angeles Rams. Not surprisingly, Cook is the first (and only) tight end in the NFL's now entire 100-year old history, to have a 100-yard-receiving game for four different NFL teams: the Tennessee Titans (who originally took him in the 3rd Round of the 2009 NFL Draft out of the University of South Carolina under then-Gamecocks head coach Steve Spurrier), and then with the Rams, Packers and Raiders.